Bose launches SoundLink wireless Bluetooth speaker | What Hi-Fi? Bose has announced the SoundLink Wireless Mobile speaker, a portable Bluetooth speaker, on sale now for £249. The speaker will connect wirelessly to any Bluetooth-enabled device, from smartphones to tablets to laptops, using the latest A2DP Bluetooth 2.1 – though no sign of aptX. Offering up to 8 hours of use from the rechargeable battery, the SoundLink also has an auxiliary input for non-Bluetooth devices. The speaker uses four mid/treble speakers and two passive radiators yet still stands just 5cm thick and around the size of a hardback book. An integrated cover, reminiscent of the iPad's, doubles as a stand and then turns the speaker off when it snaps around in front of the speaker to make a portable unit. Bose is bullish about the SoundLink Wireless Mobile speaker's durability too, that cover making a nicely sealed product that should withstand salt, fog, sand and more (says Bose). The standard model comes with a dark gray Cordura nylon cover and is £259. The LX model, with a premium trim around the speaker and a dark brown leather cover, is £299. Covers in different colours are also available, with bright red or royal purple nylon covers at £25 a pop, or burgundy or tan leather covers at £50. 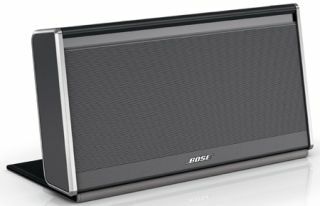 The Bose SoundLink Mobile speaker is on sale now from Bose retail stores and www.bose.co.uk.